This is Sarah Winchell from Teaching Resources for the Classroom. I know some of you are finished with your school year but many of you are like me still plugging along...trying..to..keep..the kids...engaged!! My favorite way to keep them engaged is focusing on animals. I always end the year by adding some extra creatures to my classroom. I have a guinea pig named Sweetie, a rescued Eastern Box Turtle ( it's shell had to be super glued together! ), named Dash and various creatures that come for a visit like tadpoles, earthworms and millepedes! The current famous visitors are our developing Monarch Butterflies. 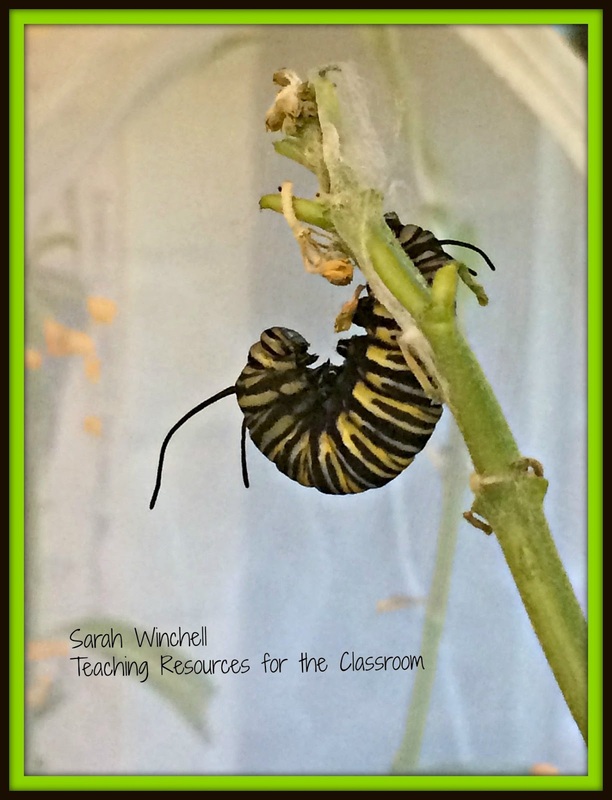 We get the Monarch Caterpillars in eggs on a Milkweed Plant. Milkweed is the only plant Monarchs eat. They quickly change into a caterpillar. This happens after nearly eating all the leaves off the plant. 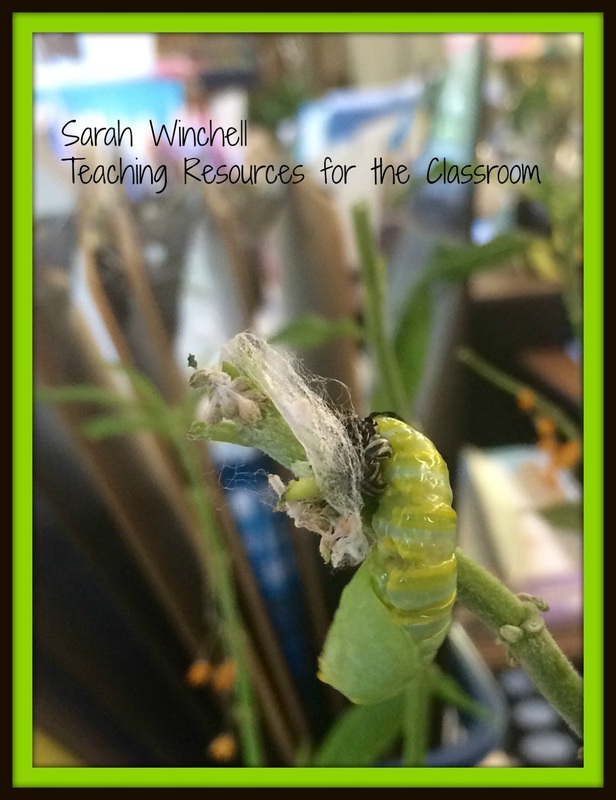 Growing caterpillars are eating machines!! 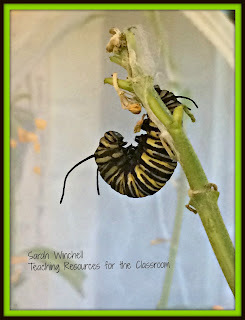 If we are lucky we get to witness the caterpillar shedding it's skin and making the chrysalis. Quick fact: Only butterflies make a chrysalis! Cocoons belong to moths. I always make sure my kids know this important science fact. 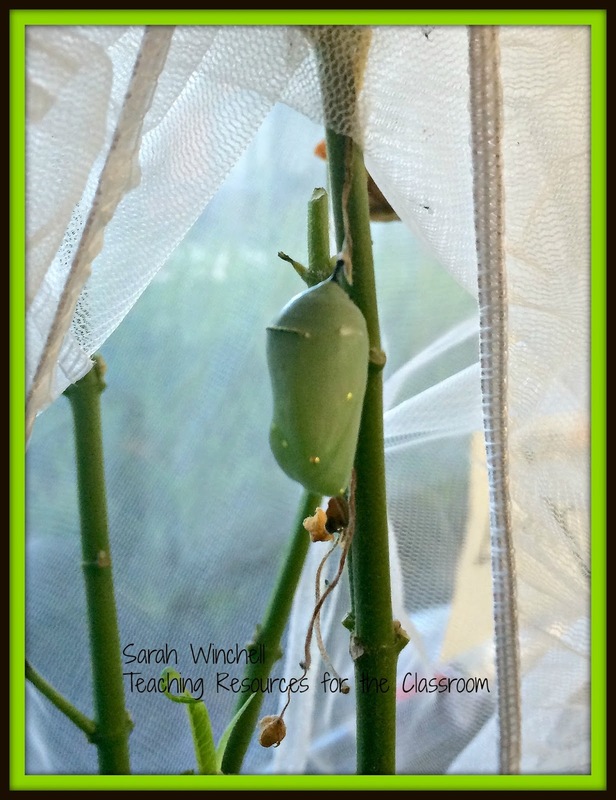 After a lot of hard work the caterpillar creates a lovely work of art in the form of a chrysalis. 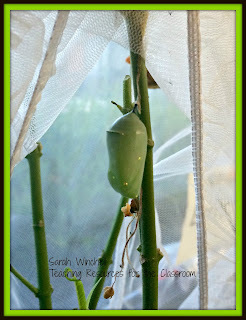 The Monarch Butterfly has the most beautiful chrysalis among the butterflies. The children are totally engaged and fascinated by the whole metamorphosis process. Butterflies have a complete metamorphosis going from egg, larva (caterpillar), pupa (chrysalis) to the adult form...The beautiful Monarch Butterfly. This is an amazing video. You can hear the children chattering in the background. If you want to keep students engaged... add some creatures to your classroom! We have made books, read books, learned about life cycles and the survival of the fittest as one of our caterpillars made a bad chrysalis and wasn't able to survive. The miracle is that 3 are thriving and the biggest surprise is yet to come!! We are all expectant parents!